Articulating Wall Mount with Anti-Theft Lock for iPad / Samsung Galaxy Tab Pro / LG / Asus Tablets [AP005581-U10] - $99.95 : allputer.com - Accessories for all your Portable Electronics & Computers! 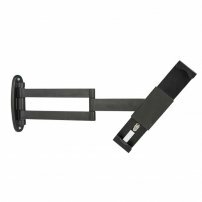 Complete your home, business, or public display with this easy-to-use locking and articulating iPad / Tablet wall mount. Built for long term, frequent, and safe use, this wall mount will improve your tablet usage for years to come. It is designed to use with the iPad Air, iPad Pro 9.7, iPad 8 and other tablets, allowing access to all ports, buttons, and cameras. With the secure key lock, you will never need to worry about a theft. Made from steel high quality grade material, you can be certain this stand wont break or fall apart on you. It is available in Black and White for modern and aesthetically appealing. - Public Accessible. For a modern public display go with this tablet wall mount. This secure mount is built for easy access, and public settings while protecting your iPad. Ideal for kiosks, businesses, schools, dorms, retail, offices, lobbies, hotels, hospitals, events, etc. The tablet home button and power supply openings allow full functional use of the iPad. - Ease of install. Simply attach this tablet enclosure to the wall with the provided hardware. - Locking and Security. The lock and key feature keeps this public display holder a safe and secure case. Anti-theft design suits a wide array of applications for security purposes. - Organized Design. Slim profile and elegant design keeps this wall mounted tablet holder sleek and contemporary. - Hardware and Engineering. The solid steel makes this mount secure, and stable. It won't move, wobble, tilt, or wiggle when your tablet or iPad is in use.